Imagine with me, that it is a beautiful August evening that isn’t blazing hot and it is 8:00 p.m. Along with that beautiful setting, you see that there is going to be a Twitter chat about Grammar. I’m assuming most people will find better things to do. 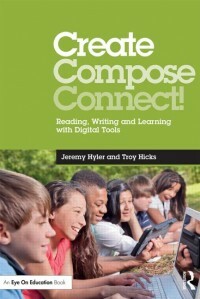 That particular setting wasn’t fiction, it was real and led me to another wonderful opportunity to lead the #miched chat with my co-author Troy Hicks on the topic of grammar. Miched is the hashtag for Michigan educators and many others from across the nation to chat on Twitter about certain topics. Last Thursday was part of the Michigan author series that is taking place throughout the month of August. 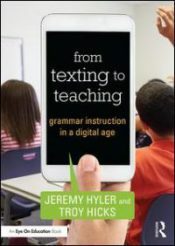 Dr. Hicks and I released the book From Texting to Teaching: Grammar Instruction in a Digital Age for which the conversation revolved around. After introducing the history of grammar at the beginning of our book, we discuss strategies for grammar instruction while incorporating technology. During our conversation, the importance of grammar was challenged. The question came up from one of the participants about, “Is grammar really viewed as being important anymore?” This question really started to eat away at me after reflecting and processing what the question was truly asking. That particular question was discussed for at least ten minutes. With keeping that question in mind I started to think back to the many times I visit my local news website and see news articles riddled with grammar errors. Honestly, does anyone proofread these articles? Last year, I sent a short email to my local news station about an article I read and respectfully pointed out two errors. Though I wasn’t expecting a response, I wanted them to know that I am a teacher and I want authentic examples for my students to see and use. It was disheartening to see such poor writing skills from professionals. By the end of the day, those “professionals” emailed me back. Instead of owning up to their mistakes and potentially saying they will do better next time, they pushed the blame onto the Associated Press. Hmmm, okay…did anyone read the story before just clicking a few buttons to throw it on their website? I’m guessing it was no one. I will also go out on a limb and say the news station wanted to be the first one locally to get the story up and out to viewers no matter if it was riddled with errors or not. So, getting back to question of is grammar losing its importance, I am still leaning towards no. Do certain entities put less emphasis on grammar? Absolutely. For examples, there are companies such as Sarah Lee (Double Negative in their slogan) that use poor grammar to advertise their product. It does not mean that we should abandon the use of proper grammar or place less importance on it.